Seeing as there are relatively few noopept reviews out there (compared to other nootropics), I thought I’d share my thoughts. I’ve been using the nootropic “noopept” for 30 days, every day. This is my comprehensive review of how I felt – what noopept did for me, and what I felt it was lacking. If you’re considering noopept, you can analyze my experience and decide if it’s for you or not. Did I experience those effects? You’ll just have to keep reading to find out. 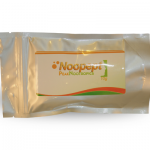 The recommended range for noopept is 10mg to 40mg per day. I started with 10mg per day for the first week. Truth be told, I didn’t feel much, and I wasn’t convinced that this miniscule amount of powder was anything but placebo. But when I ramped it up to 30mg per day on the second week (split into two doses of 15mg at breakfast and lunch)… well, I felt some very noticeable effects. Right when I took the dose, I felt a rush similar to the rush you feel when you chug that first cup of coffee in the morning. It was a great boost to clear the morning cobwebs and get me focused after lunch – normally, I fall into a food coma for an hour or two after my lunch break. My verbal articulation was through the roof! When a client asked me a question, I could concisely and effectively explain the answer to get him sorted out quickly. This meant that I had more time to handle more clients. Although I don’t know for sure, I felt like my memorization skills were vastly improved. Studying for school felt fun – not like a chore – and as I’ll explain below, my grades went up. I just felt better. I don’t think this was a direct result of the noopept, but when I was killing it at both work and school, I felt like I was doing well in life, you know? Homework/studying – I can safely say that memorization for exams was easier. And if I learned a concept in class and then had homework at night, I wouldn’t have to leaf through the textbook to get help. I remembered everything from class and could do the homework at the speed of light. Being in class – I actually got a little bit annoyed in class. Because my mind was so clear, I felt like the professor was going way too slowly. I raised my hand a lot more than usual, but got annoyed when other people asked questions that I already knew the answer to. I wasn’t angry or anything… I just felt like I was operating at a higher level than others in the class were. Explaining was so much easier – as I said before, a lot of my time is dealing with clients who don’t fully understand the product, how it works, how to set it up, etc. I felt that I could take their questions and concerns, think for a second, and address them right away. My speech sounded smarter, too – I wasn’t using empty words like “good” or “nice” too often. Started receiving a lot more positive feedback – perhaps because of my clearer articulation, clients seemed a lot more happy with the help they were getting. How it affected me otherwise – sociability, fitness, etc. Felt a bit more social, I guess – I’m not sure if this was placebo, but it was easier for me to strike up conversations with people in public. I stood up straighter, spoke with more power, and it seemed that workers (at coffee shops, grocery stores, etc.) were much more friendly to me. Fitness – I didn’t notice any change in physical energy levels, but I did have more time to work out because of how quickly I was completing my homework and studying for my exams. A lot of websites online promoted noopept as a “miracle drug” like seen in the movie Limitless… it wasn’t. I didn’t have more energy, and I didn’t turn into a genius. But I did notice myself operating at a “higher level”. So I wasn’t a genius… but I could speak my mind more clearly regarding what I already knew for my job. And when I studied, I couldn’t speed-read or learn information significantly faster than before… but I did do better on the two exams that I did have, and I felt like I was getting a lot more out of going to class (when I decided to go, that is). I’ll continue to take it as long as I continue to feel these benefits. Considering I haven’t felt a single side effect, I see no reason not to. Have you taken noopept? Considering doing so? Comment below! Thanks for reading.